In July 2007, Studio Electronics signed an agreement with the estate of Stephen St.Croix, to sell and service the Marshall Time Modulator and Tape Eliminator. Lots of engineers know these remarkable units, and they are highly regarded in the industry. Here’s a brief history, and for those who don’t know the MTM, a explanation of what it does. The MTM is an analog effects unit that Steve developed in the late 70’s. It doesn’t truly modulate time (you can’t go back and buy Apple stock for $15! ), but it does modulate and manipulate audio delay time, producing many unique and amazing effects. The input signal passes through two analog delay lines. The delay time is adjusted by manual control, a wide range LFO circuit, or (for most effects) a combination of the two. Dry and delayed signal are combined, with feedback added as desired. This simplified description may sound dull, but the sounds produced by the MTM are utterly amazing. Effects include positive, negative, and resonant flanges (What is flanging? ), cardboard tube echo, automatic double (and triple) tracking with pitch and delay dithering, circus vibrato, arpeggio, pitch quantizing, and many more. The MTM was used on many hit records. In an interview with the Device Newsletter (click to download) in 1979, Steve said that he developed the very first prototype in 1975, to win a bet. He brought it into a studio to try it out in session, and everyone was blown away. The AES Convention happened to be a few days away, and everyone encouraged Steve to produce a finished demo model and show it, which he did. His booth was mobbed at the AES and the Time Modulator instantly got lots of great press. Initial prototype runs were produced, with early units going to Stevie Wonder and Sound 80 Studios in Minneapolis. Wrestling with improvements and tweaks, it was another two years or so to before Steve went into production. But when the 5002 Time Modulator was finally released it scored rave reviews in Studio Sound, REP, and Modern Recording, and sales took off. The 5002 was followed by the 5402, which featured a new control set and greatly extended delay times. 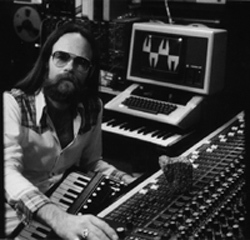 Steve also developed the AR-300 Tape Eliminator, which simulated delay at various tape “speeds”. It included a tape-like EQ curve and natural sounding tape compression — like the simulators released today. Of course, he beat the new guys to it, by 20 years or so! It’s worth repeating that these are analog boxes, totally free of quantization noise and other digital artifacts. The MTM has a signal to noise ratio of 95 db! This is an amazing and unheard of spec, that most modern gear still can’t equal. Steve was a real perfectionist. Plug in a Time Modulator, turn the monitors all the way up and you hear…nothing. No background noise. Stepping into Steve’s tech room after his passing, we found a number of unfinished Time Modulators and Tape Eliminators, along with an inventory of front panels, pots, knobs, selected IC’ s, and other parts. Fortunately there were thousands of pages of notes, calibration procedures, and schematics, and though they were incomplete and a bit scattered, most of the important info was there. About six months into the project, we understood most of the repair and calibration tricks, and were becoming pretty comfortable with Marshall gear. 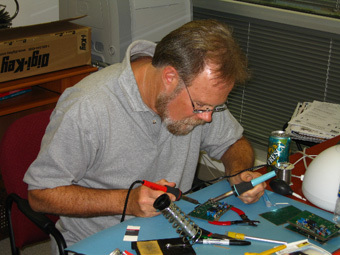 Steve produced Time Modulators and Tape Eliminators for just a few years. dbx cut off the supply of the 303 compander boards he needed, and the parts for his proprietary analog delay modules became unavailable. His always–percolating brain probably became bored with servicing these familiar models when there were so many new challenges and pursuits to tackle! Fortunately, we’ve been able to source plenty of dbx 303 boards, unlock the secrets of his delay modules, build new top and bottom covers for the units, and have acquired all the other little parts needed for Marshall gear. We build new “plug and play” power adapters, and have reverse engineered the missing schematics. Please note: Prices above do not include replacement delay modules, power adapters, or other major parts. If we find that major parts or additional labor are required, we’ll notify you promptly. A 50% deposit is required. Please note that all declined Marshall repairs are subject to a $100 testing and evaluation fee. Mr. St.Croix also authored the Fast Lane column in Mix Magazine for 18 years. He proposed a device to make legible the “erased” Nixon tapes after Watergate, and later founded Intelligent Devices. I.D. produces hardware and software for forensic audio and law enforcement applications. The company has been very successful and is still active. There’s much more that we’d like to say about Mr. St.Croix and the amazing Time Modulators. Steve was a true renaissance man, surely a genius. We’re very grateful to his estate and Intelligent Devices for allowing us to help carry on the legacy of these amazing products.